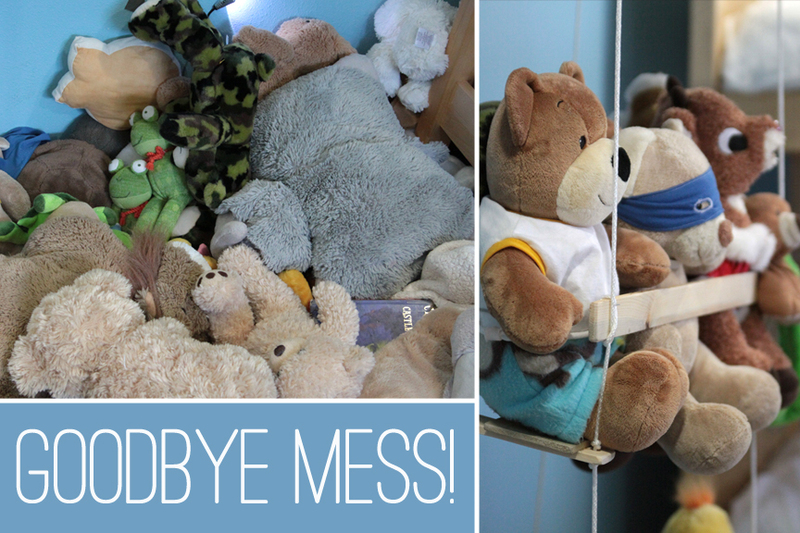 Home > Life Hacks > 9 Creative Toy Storage Ideas to Help You Calm the Chaos! Are you tired of tripping over toys? 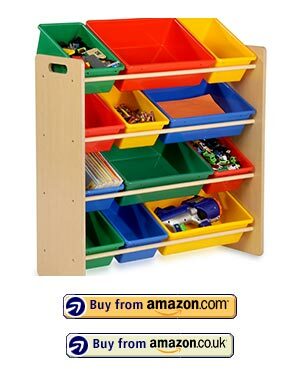 I am and its inspired me to collect the best ideas I could find for children’s toy storage ideas! Do you remember those days, before you had kids, when you used to be able to see your carpet and move from room to room without living in fear of standing on a small but extremely dangerous piece of LEGO? I never realised just how quickly toys can take over your house. We have a playroom for goodness sake yet still there are toys in the living room and even the kitchen! Enough is enough. 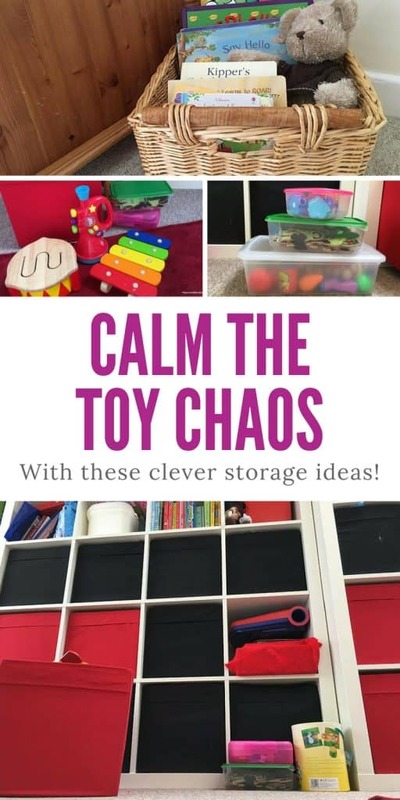 It’s time to bring some calm to this chaos and that’s why I just spent a few hours researching the best children’s toy storage ideas I could find and I thought you might like to see them too! If you are overwhelmed by the number of toys that have taken over your home then it’s quite likely your child or children are overwhelmed too. One sure fire way to decide if you have too many toys available is to watch them playing. Do they pick out a toy and give it their full attention for a period of time? Or do they flit from toy to toy, emptying boxes and generally just roaming around? If it’s the latter then they just have so many toys available to play with they can’t focus on just one thing. Which is not good. Don’t worry though, with a little bit of time and effort you can tame the chaos and help your child rediscover his love for playing again. First up you need to be ruthless and sell or donate any toys that just aren’t age appropriate. If you really can’t bear to part with your child’s first toy then package it up and put it away in the attic. 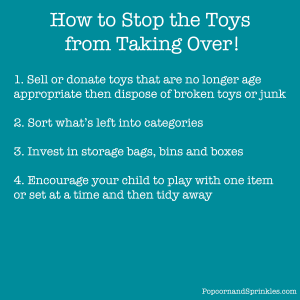 Now go through and dispose of any toys that are broken (and can’t be repaired) or are just plain junk (like plastic party bag toys or stuff picked up from the Dollar Store). Then you’re ready to sort what’s left into categories so that your child can play with them. We like to theme our toys so as an example we have anything farm related kept together, and this can include farm animals and barns as well as jigsaw puzzles or games. We have another themed set of safari animals and princess related items. If it doesn’t fit a theme then we just store it with similar toys, so all the remaining jigsaws are together, and all the play doh sets. Once you can see your sets and collections you will have an idea of what sort of toy storage you need. Whether it’s bags, boxes or bins you’ll need different sizes for different sets of toys, and we’ll cover all the options a bit further down this post. Use your storage bags, bins and boxes to coral the toys and then encourage your child to just take one set at a time to play with. When everything is out of sight except that one set of toys they will be able to focus their attention and really get the most out of their play. When they’ve finished help them tidy everything back into it’s container before moving onto something else. Your child will learn to be responsible for their own toys, and you won’t have to spend hours picking up after them once they’ve gone to bed! Toys come in so many different shapes and sizes that you’re going to need a range of storage solutions to keep everything under control. Here are some of the best kid’s toy storage ideas we could find, for everything from toy cars and Barbie dolls to bikes and scooters. 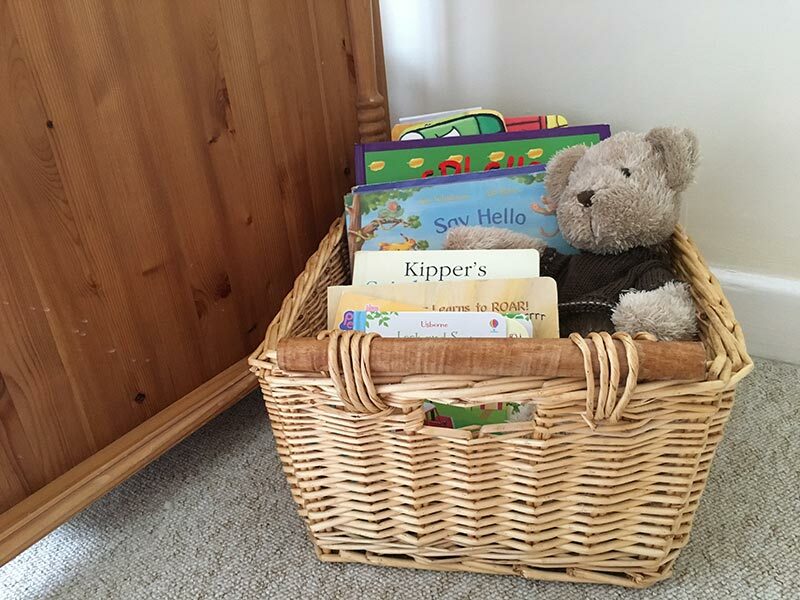 You will want to store some of your children’s toys out of sight, especially if you’re using a toy rotation method to calm the chaos. We use a number of cube units (like these) in our playroom because they are perfect for keeping toys out of sight and out of mind until we want the kids to play with them again. We use cloth cubes (like these) to keep the toys hidden away and then it’s really simple to just pull out a cube and set the toys out to be played with. We spent some time organising the toys into categories before filling these cubes, so one has all the farm themed toys, another has the food and accessories for the toy kitchen and then one for jigsaws and another for board games. You can categorise your toys in the best way for your family and your children. The cubes are quite big so we use plastic shoe boxes (like these) and reusable food containers (like these) to keep smaller toys together within the larger cube. If you have older children and you want to give them the responsibility of selecting and then tidying away their own toys you should think about adding labels. Angela has a really cute set of toy box labels that you can download for free and edit to fit your needs. 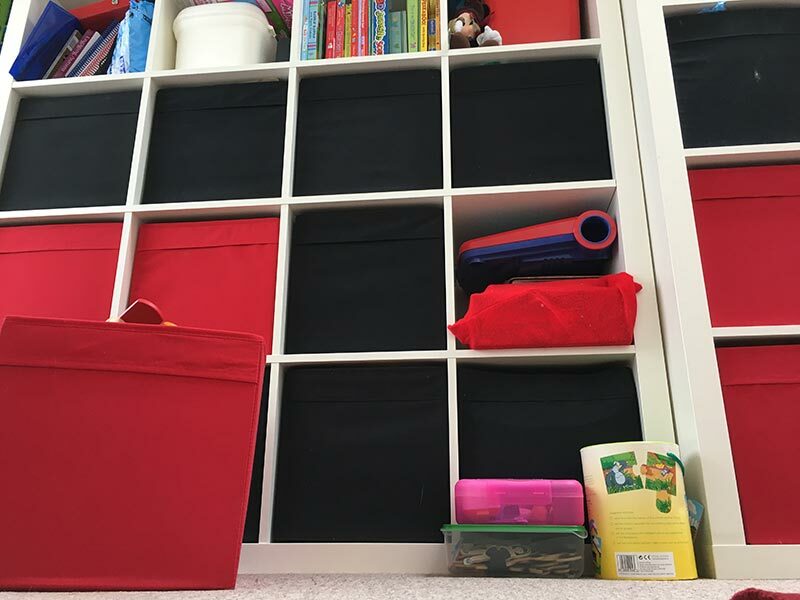 Your kids probably have some “favourite” toys that they want to play with every single day so rather than putting them away in the storage units consider investing in an open storage bin system like this one. The plastic toy storage bins come in different sizes so you can store all manner of toys in them from LEGO and small cars to Barbies and jigsaw puzzles. 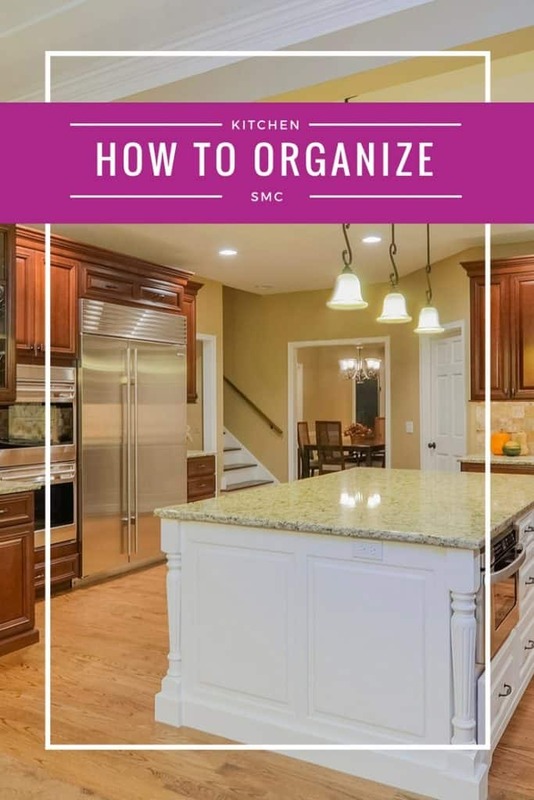 You can encourage your child to pick out the storage bin they want and take it somewhere to play, and then to gather everything back into the bin and place it back in the unit when they’re finished. This makes tidying up at the end of the day a whole lot quicker. If your child has more stuffed animals than the zoo you might be wondering how on earth you are going to keep them from taking over their bed so they can actually get in there to sleep at night. The simple answer is toy storage nets, like this one. This particular hammock can expand to six feet so it holds a lot of stuffies. It’s entirely up to you whether you put it up out of your child’s reach so they can admire their stuffed animals and bears from a safe distance, or whether you want to hang it low enough that they can get their pals in and out when they want to play with them. Just keep in mind that anything hanging from the wall like this can be a strangulation hazard so up high is safer for little ones. If you (or your hubby) are good with simple woodworking projects then check out this adorable hanging toy storage idea. 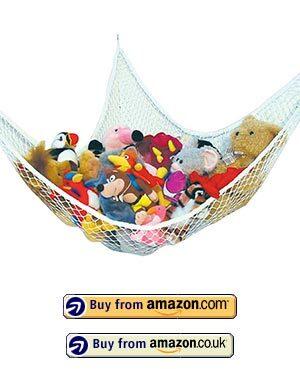 What child wouldn’t want to help all of their teddies into a swing each night before bed? Talk about making tidying up fun! 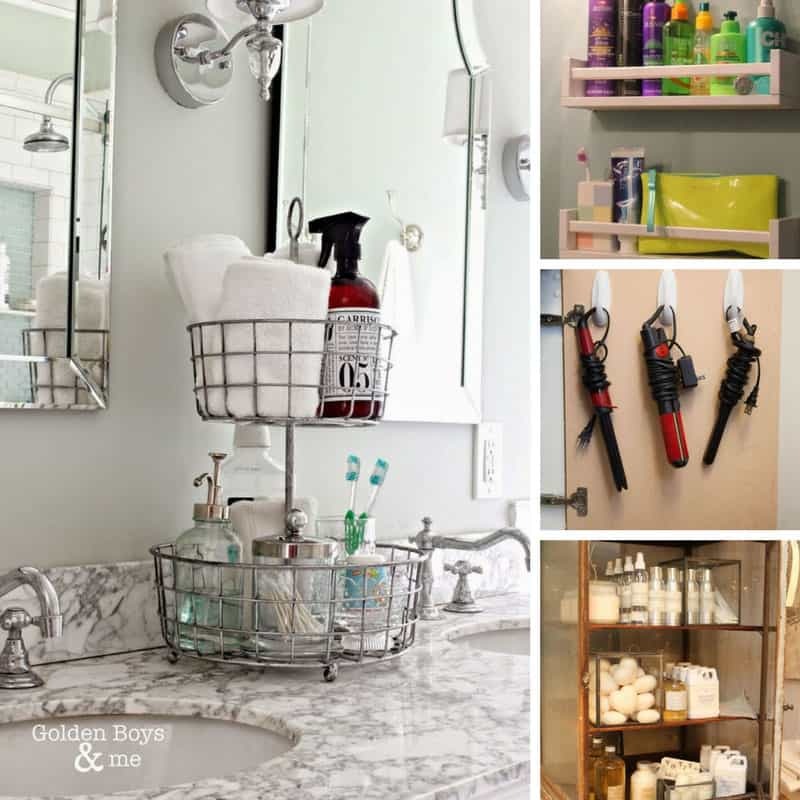 Storage nets (like this one) are really handy for bathroom toy storage. 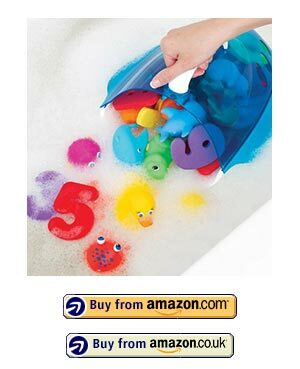 It fits in the corner of the bath so it’s out of the way and has a mesh bottom so the toys can all dry out, after all there’s nothing worse than mouldy bath toys! Another option is this clever scoop which has drainage holes in the bottom. Just scoop out the toys and then hang the scoop on the hanging bracket so they dry out ready for next time. 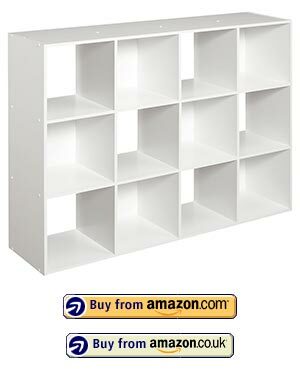 If you have more books than the library floating around your home you will need some clever way to store those too. 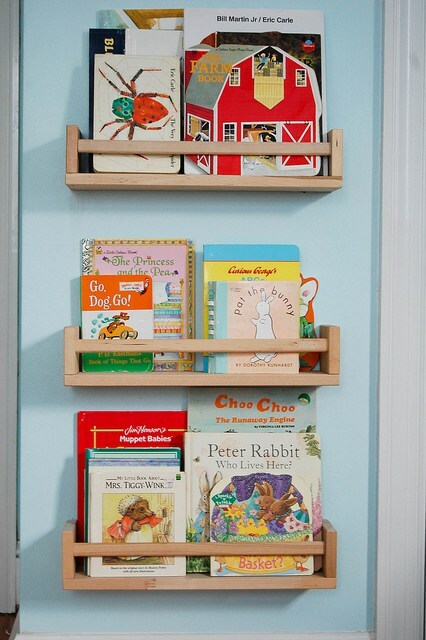 We love the idea of using spice racks to make cute front facing book shelves. We’ve bought the racks and are just waiting to move to our new house before we put them up! Painted wooden crates are a fabulous way to create some DIY book storage shelves. You can stack them up at floor level so your child can reach the shelves or position them higher up (just make sure you attach them to the wall so they don’t present a falling hazard). The downside of using shelves for books if you have toddlers around is that it’s very easy for them to pull every single book off the shelf. JJ loves to pull all the books off the shelf and pile them up on his lap, I think it’s a sensory thing! That’s why I’m a big fan of book racks like this one from Tot Tutors. Your little one can see the books and they’re still pretty easy to access, but it’s not so easy to pull all the books off in one go! Just make sure you attach it to the wall for safety. 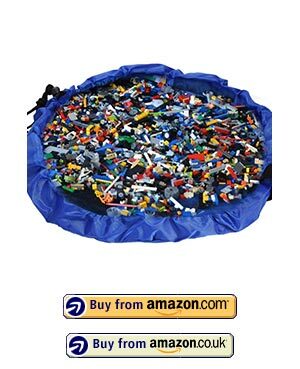 If your kids love LEGO then one of these drawstring bags will fast become your best friend, because it opens out into a giant (60 inch diameter) mat. So it’s simply a case of open it up, spread out the cloth, play with the LEGO then use the drawstring to close it back up again. Which should drastically reduce the chances of you stepping on rogue pieces of LEGO when the kids have gone to bed! Our kids aren’t quite old enough for LEGO yet but we had one of these when I was a kid and they’re just GENIUS! 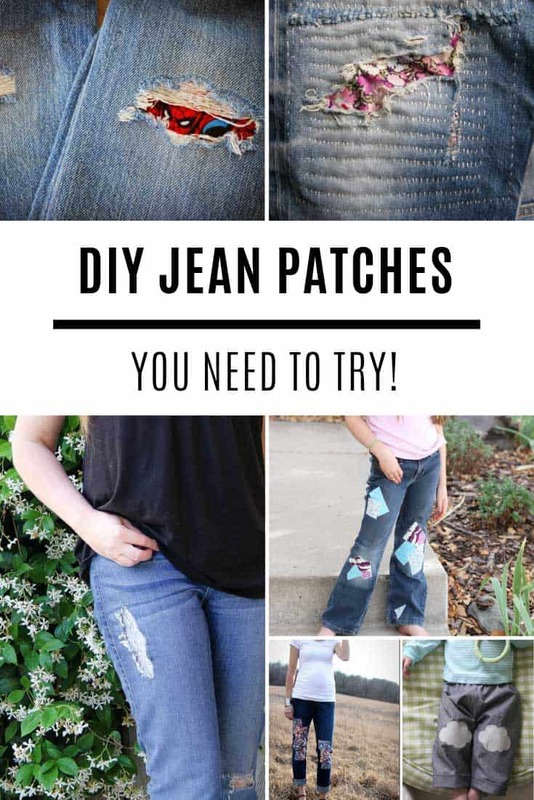 They’re useful for other toys too like action figures, Barbies, or even tea party paraphernalia. If your child has toys that he regularly takes with him to a friend’s house or to grandma’s then a storage bag/mat is a great solution. If it’s matchbox cars or Hotwheels they love check out this version which is slightly smaller but has a road printed on the mat! If your child is a stuffed animal fan and isn’t keen on their furry friends being stored in a hammock then you should take a look at this clever bag which as well as being soft toy storage also doubles as a bean bag seat! We like to use wicker or seagrass baskets (like these) because they’re nice and sturdy and the handles make them easy to carry about. If your child has larger toys like a Playmobil playset you might not be able to fit them into a storage bin or bag, in which case you’ll need a storage chest instead. 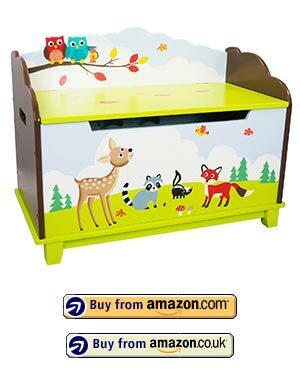 Toy boxes come in all shapes and sizes and a range of prices too. You can buy fabric toy boxes decorated with characters from Frozen or Thomas which will work for you if you have older children who understand that they can’t sit on the box. For younger kids you will be better off investing in a wooden chest that can also serve as a bench seat and will last a lot longer. Once you have organised the toys in your house it’s time to think about the ones that your kids play with outside too. For smaller toys like bats and balls, buckets and spades and even toddler ride on toys, a deck box (like this one) will do the job perfectly. 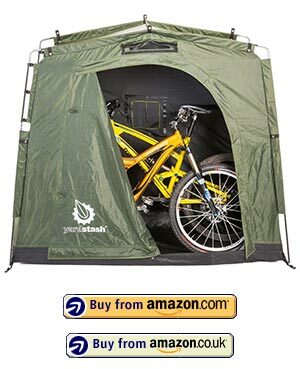 For larger toys like trikes, scooters or bikes you’ll want a storage shed instead (like this one). If you don’t have the budget for a storage shed check out this clever solution. I can’t believe I didn’t start this organizing project sooner! 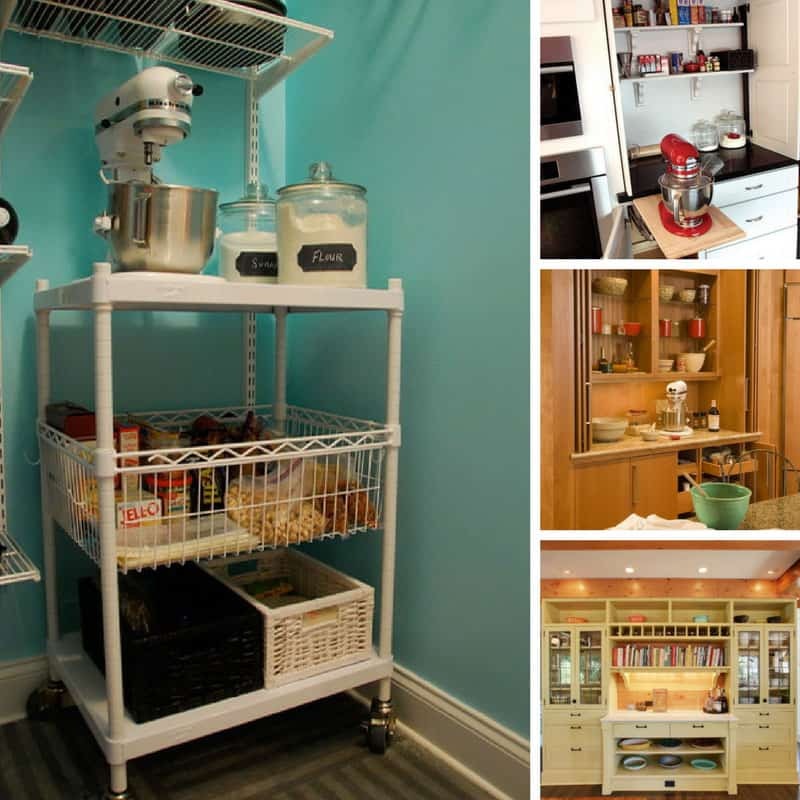 Seriously, just a few simple storage cubes, baskets and shelves and suddenly the house looks entirely different. No more toy chaos. No more tripping over farm animals and standing on LEGO blocks. And the kids have room on the floor to actually play!